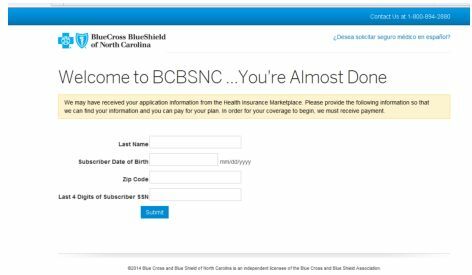 Customers that apply for a policy on the Marketplace can access the BCBSNC website to make payment via credit card, debit card or bank draft. The customer may utilize this option 3 business days after they have successfully submitted their application on healthcare.gov. This is the time it will take for BCBSNC to get the file from the Marketplace and process it. If they access it before the data has been received and loaded, an error message will display that the application cannot be found. The customer has until the day before their effective date to access this online payment process. After that, the application will expire and the customer will need to reapply. The customer will need to enter 4 identifying pieces of information. This information needs to match what was entered on the healthcare.gov application. If the customer did not enter a SSN on their marketplace application, they cannot use this process. Note: If this message appears, please make sure the data exactly matches the application. In addition, allow ample time (three business days after submitting the application via healthcare.gov) for BCBSNC to receive and process appropriate information prior to calling. At this point, the customer will follow the normal Buy Online process – create a BCBSNC user ID, enter demographic information, opt in or out of a dental policy and then enter payment information.